Last week, a new Assassin’s Creed game mode was released which vividly brings ancient Egypt to our living rooms. Science researcher Rodrigo Salvador explains how this game can educate as well as entertain, and dives into our own Ancient Egyptian collections. No ancient civilization has captured the public’s imagination more than Egypt. The pyramids, sphinxes, animal-headed deities, hieroglyphs, and the unique art style all add to a sort of alluring mystique. This fascination has a name: Egyptomania. This term was used to describe the renewed interest of 19th century Europeans in Ancient Egypt right after Napoleon’s Egyptian Campaign. 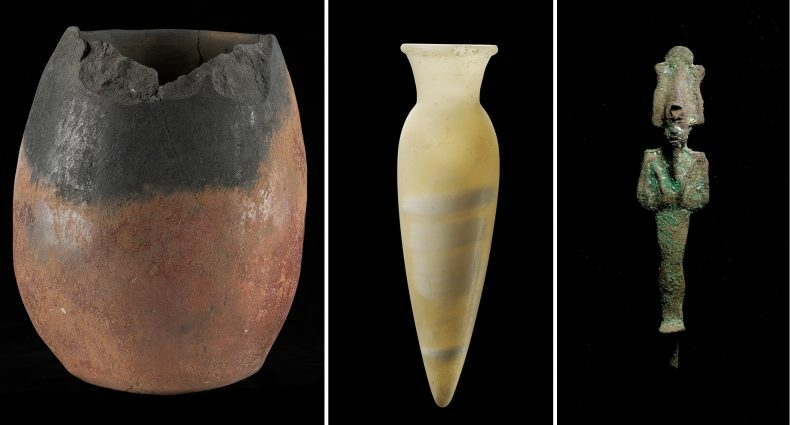 The artefacts they brought back influenced architecture, interior design, and fashion. The first wave of Egyptomania eventually wore off, but it always comes back, be it with the discovery of King Tut’s tomb in the 1920’s or with Indiana Jones and the Raiders of the Lost Ark in the 1980’s. 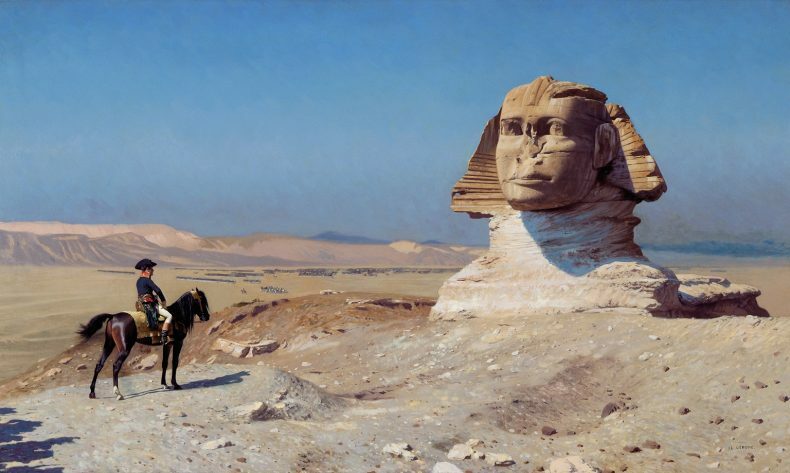 Bonaparte devant le Sphinx, oil on canvas. Credit: Jean-Léon Gérôme (1867–1868). Wikimedia Commons. Just last week a new Ubisoft game mode from the franchise Assassin’s Creed was launched which vividly brings Ancient Egypt to our living rooms. 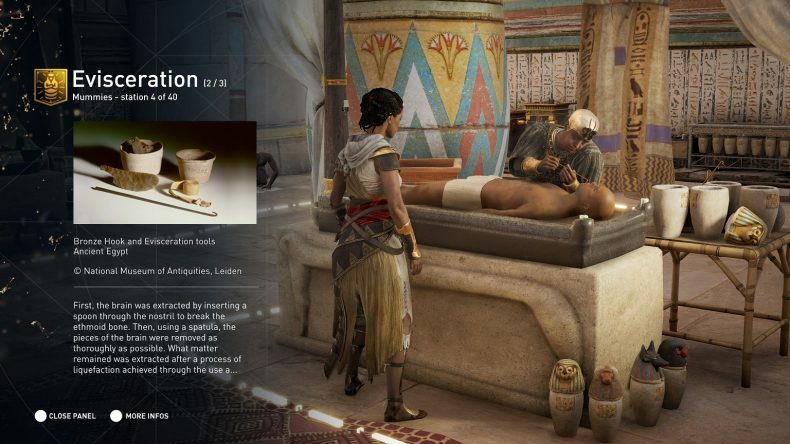 The most recent entry in the series, Assassin’s Creed: Origins, takes place during the reign of the last pharaoh, Cleopatra VII. 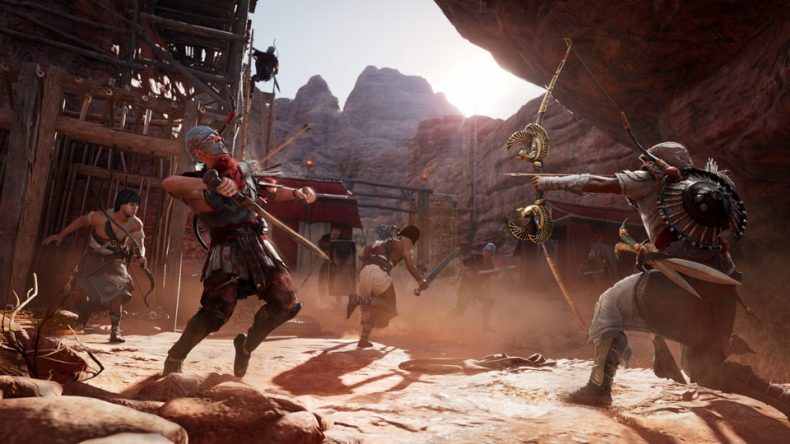 The game focuses on the adventures of the medjay Bayek and involves lots of parkour and sword fights, as expected for the franchise. However, what is most impressive in the game is the painstaking reconstruction of Ancient Egypt. 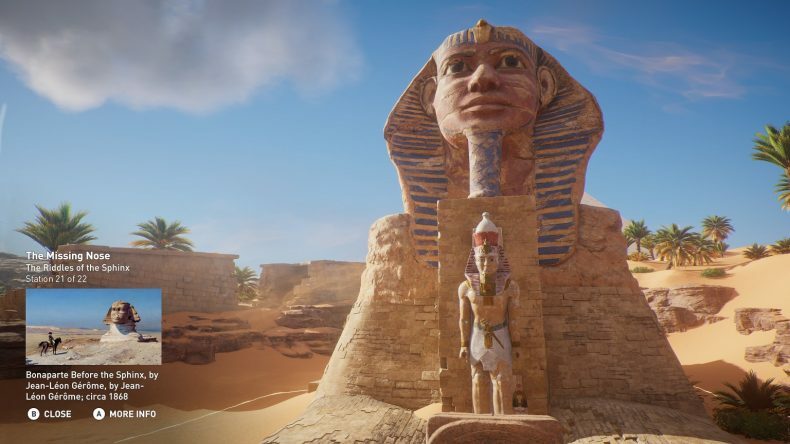 Backed by a team of Egyptologists, Ubisoft went to great lengths to achieve historical accuracy. Naturally, it would have been a waste of effort to just serve this as the backdrop for some neat combat action. Educators everywhere were already using Assassin’s Creed games as teaching tools and claiming for more. So Ubisoft launched a new mode for their latest game, named Discovery Tour by Assassin’s Creed: Ancient Egypt. In this mode, you are able to peacefully explore the game’s setting without all those pesky soldiers and bandits trying to attack you. Ancient Egypt just became a huge virtual museum that you can access from the comfort of your living room. The Discovery Tour provides tons of information about every aspect of Ancient Egypt, from pottery and professions, to the biographies of historical figures. You can visit several famous locations and also take part in 75 virtual interactive tours – all of them curated by Egyptologists, of course. As a long-time fan of Assassin’s Creed and a total Egypt geek, I decided to step out of my zoology abode and explore Te Papa’s very own Ancient Egyptian collection. New Zealand seems to be as far removed from Egypt, but surprisingly Te Papa’s collection holds a bunch of Ancient Egyptian artefacts. They were given to Te Papa, or more specifically to our predecessors the Colonial Museum and Dominion Museum, by the Egypt Exploration Fund and a handful of other donors. The items cover the entire history of Ancient Egypt: from the Predynastic Period (prior to 3100 BCE), past the Ptolemaic Period (ending in 30 BCE with Cleopatra VII) and into the Roman Period. This easily amounts to nearly 4000 years of history! Examples of Egyptian artefacts in Te Papa’s collection (not to scale). Left: black topped jar, Predynastic Period. Te Papa FE000060 [licence CC BY-NC-ND 4.0]. Center: vase, Old Kingdom (Sixth Dynasty), Te Papa FE000054 [licence CC BY-NC-ND 4.0]. Right: figure of Osiris, Late Period, Te Papa FE000416 [licence CC BY-NC-ND 4.0]. Maybe the most astounding artefact in the collection is a sarcophagus, donated in 1885 by Charles Rooking Carter, which holds the mummy of a girl named Mehit-em-Wesekht. Mehit was a daughter of a priest, and of modest status in Egyptian society. She lived during the beginning of the Ptolemaic Period, circa 300 BCE. She was 18 years old when she died, but we do not know the cause of her death. The sarcophagus is not on display at Te Papa, but you can learn more about the sarcophagus in this Tales from Te Papa episode. But there are other mummies, that for me are potentially more interesting, like the one below belonging to an ibis. Animal mummies were very popular during the late periods of Egyptian history. They were used as votive offerings to seek favour from the gods and each animal was linked to a certain god or goddess. Ibises were dedicated to Thoth, god of wisdom, writing, magic and ‘science’. Because of this strong link to religion, the actual animal species is now known as ‘sacred ibis’, Threskiornis aethiopicus. 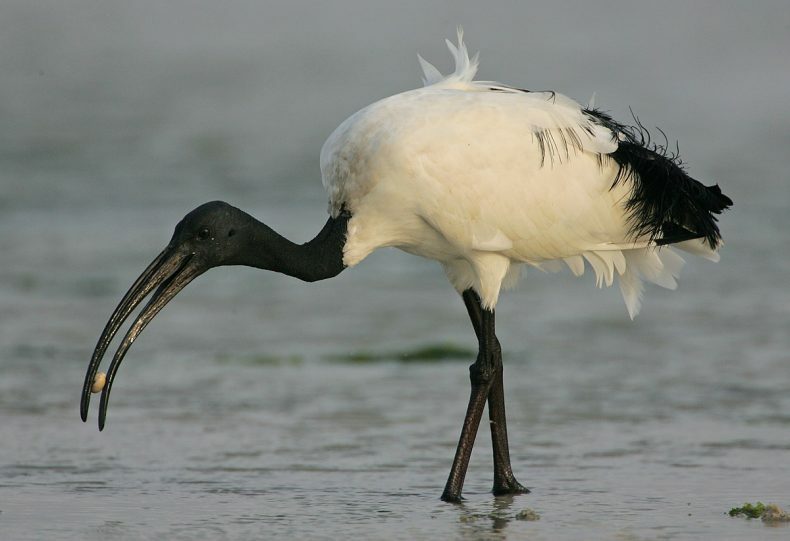 Curiously, the sacred ibis is the sister species of the Australian white ibis (Threskiornis molucca), which sometimes pop up around New Zealand. So if you’ve also been caught by Egyptomania, you can start exploring Ancient Egypt right here in New Zealand. Why not start with a browse through Te Papa’s Collections Online or with Assassin’s Creed virtual tour? Further Playing: Go grab your copy of Assassin’s Creed Origins for Xbox One, PS4 or PC – the Discovery Tour is a free update! The Tour is also available as a standalone game on PC (via Uplay and Steam). Further Reading: A very good introductory book is Ancient Egypt, by David P. Silverman (1997, Oxford University Press). If you want to know more about the famous last ruler of Egypt, Cleopatra: A Biography by Duane W. Roller (2010, Oxford University Press) is your go-to book. Finally, these books have everything you need to know about mummies, be they human or of other animals: Egyptian Mummies by John H. Taylor (2011, University of Texas Press) and Soulful Creatures by Edward Bleiberg et al. (2013, Brooklyn Museum). A major part of this was influence on New Zealand product design from Hudson’s confectionery to Hawkes Bay Foundry. Discovered you by a Tweet in local paper. Would love to see your artefacts as keen to learn more since visiting Egypt a few years ago. Thanks, Grace. I have just done a talk to Lions Carterton tonight, 28th Feb… and showed them about the Mummy that Charles Rooking Carter donated to NZ, and the photographs off it, as when I visited Te Papa Archives in Tory St, met up with Ross and he said take photographs Adele…. glad I did as great to show folk, especially Carterton folk who had no idea about the Mummy! There is a book being written about Charles, my talk was mainly of Charles as have visited where he came from, and where married in London.. and where his wife is buried in Burbage etc… A very interesting person to read about. Would dearly love to visit Egypt, but out of the question now…I remember coming in to Te Papa to see the Egyptian exhibition about 2007, had the chance to see one in Sydney 2006 Christmas, but said will wait and see the one in Wellington thanks nearer home! I bought a book by Charles Rooking Carter before Christmas written in England in 1870 and published n London in 1875 donated it to Carterton, but never to be loaned.. a treasure!! And as I’m not missinformed they had the same word for sun as the Maori have Ra.